Mountaineers backpack trip to Esmeralda Basin, Gallagher Head Lake, and De Roux Creek, with a side trip to Lake Ann. Overnight camp on the spur trail to Lake Ann. The Teanaway River Road road is closed at the Iron Peak Trailhead. To get to the Esmeralda Trailhead you must hike the road for about a mile. There are not many parking spots at the Iron Peak Trailhead, but since we came in on Friday morning there were still several available. Different story when we came out on Saturday afternoon. There is more parking at the De Roux camp, with about a half mile additional hike along the horse trail that parallels the west side of the road. The trails were all snow-free and in good condition, only a couple of blow-downs on the De Roux Creek Trail that were not difficult to get past. Currently there are plenty of opportunities to get water, but many will soon be drying up. There were a few mosquitoes around camp, but not near what I would expect for this time of year. 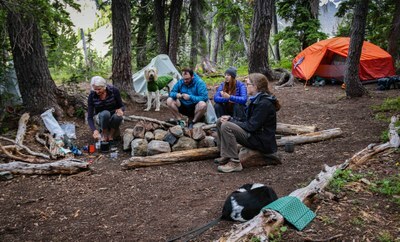 A group of five Mountaineers (and 2 dogs) headed over to the Teanaway for a two-day hike of the Esmeralda loop. We set out on the trail to Esmeralda Basin and were pleased to find that the wildflowers were still at their peak. The Teanaway is well known for the richness and diversity of its flora. Esmeralda Basin and De Roux Creek are two prime flower viewing hikes which can be combined into a loop including Fortune Creek Pass and Gallagher Head Lake. The show was especially prime higher up in Esmeralda Basin. Some of the highlights; columbine, shooting stars, paintbrush, elephant head lousewort, bitterroot, monkshood, scarlet gilia, butterwort. Following a leisurely hike through the basin, we turned off on the Lake Ann Trail and set up camp at a bench part way up to the ridge. There was running water at the bench, but may not be for long. A knoll on the east side of the bench offers several more campsites with expansive views of the Esmeralda Peaks and the upper Teanaway. We spent the afternoon with a hike over the ridge to Lake Ann, with more flower observation and a swim for the dogs. The next day we packed up and hiked over Fortune Creek Pass, down to the jeep road, and back up to Gallagher Head Lake for a lunch stop. We finished the trip following the De Roux Creek trail arriving back to the cars mid afternoon with a couple of tired dogs, and their botanically satiated humans.